The previous post introduced a passage from the last act of George Chapman’s last play, The Tragedy of Chabot. Here is that passage. tumult -> Captain -> gentleman usher -> lord -> poet -> 1000£ a year. The poet IS a nobleman. The sequence is “lord whose wit may beget a poet.” Decisive evidence. The 1000£ per year Vere received WAS for poetry/plays, not simply to ameliorate his decrepit financial condition. “a poet may get a thousand pound a year” The lord isn’t getting the money, the poet is. Again, decisive evidence. These are two absolutely huge pieces of Shakespeare Authorship evidence long-sought by researchers. We now have Chapman giving us direct evidence that has escaped the Tudor censors. But who is the Captain? And what was the Tumult? An examination of the extant evidence surrounding Vere’s 1000£ annuity is useful. Stephanie Hughes provides excellent insight into Walsingham’s role in this essay on her blog, Politicworm. Hank Whittemore’s account of the 1000 pound annuity is good also. The Literature divides into two camps. One argues against any connection to Vere beng paid for writing, citing various documents concerning Vere’s poor financial condition and the fact that the 1000£ did ameliorate that condition. There is a logical failing in these arguments, in that the fact Vere was pulled out of poverty is not proof that was the sole purpose of the annuity. The other school of thought, exemplified in Mark Anderson’s Shakespeare by Another Name and other sources notes the letter from Burghley to Sir Francis Walsingham asking for updates on the petition to the Queen in the matter of Lord Oxford, just prior to the granting of the annuity. Walsingham was the spymaster. He had also set up the Queen’s Men theatre troupe in 1583, three years before the annuity was granted in June 1586. If the annuity was solely to ameliorate Vere’s poverty, why was Walsingham pursuing it and not Burghley? That is the question many who argued against a theatrical connection failed to ask. My idea as to the identity of the “captain” in Chabot originally had three suspects; the Queen, Burghley and Walsingham. Walsingham seems to be the leading candidate. But let’s go back to Chapman’s The Gentleman Usher, where at the end of that play Mendice tells us his life story. The gipsies are the acting company. The captain in Gentleman Usher is likely the captain in Chabot. Walsingham was head of The Queen’s Men. Ergo, Walsingham is the captain in Chabot! Now on to the tumult. In 1572, Sir Francis Walsingham was ambassador to France at the time of the St. Bartholomew’s Day massacre. Sir Thomas Smith was stationed there as well. England was up in arms over the massacre of Protestant Huguenots in France. While the pulpits raged against the ‘massacre,’ the government needed to be careful, wishing to preserve amity with the King of France. In official communications the word ‘massacre’ was not used. 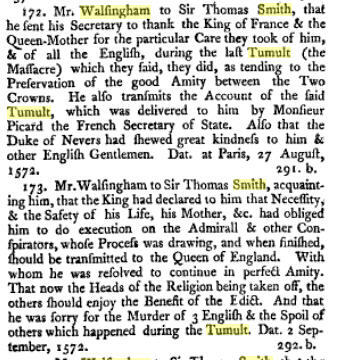 It was called “the Tumult.” Here are references to two letters from Walsingham to Smith at that time. Walsingham’s and Smith’s handling of the Tumult/Massacre (a corruption!) generated their elevation to co-Secretaries of State the following year. “a tumult may beget a captain” Walsingham owed his captaincy of State to the Tumult of the St. Bartholomew’s Day Massacre. Can there be any doubt this passage in Chabot is alluding to actual events? The tourist-funded scholars will argue otherwise, I’m sure. A few posts ago I wrote. I now think there is a third aspect to the portrayal of Vere as usher. 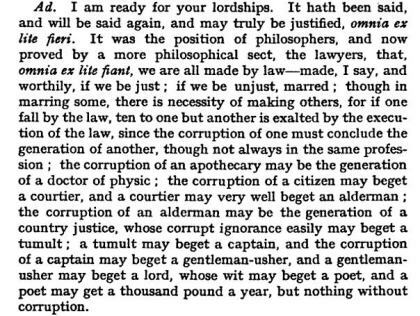 This aspect became clear when I read Richard Dutton’s gloss of gentleman-usher in the Revels’ edition of Epicene. “and a poet may get a thousand pound a year” – The poet, not the earldom recieved the money, Chapman tells us. 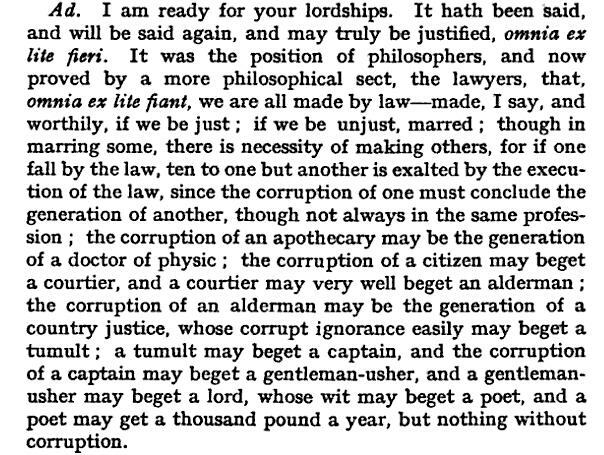 “but nothing without corruption.” And Chapman closes with a hint about the ‘why’ of the secrecy. Notice there’s no mention of royal bastards. From Corruption came Great Art. Aristotle fulfilled. All of this was made possible by the grant of 1000£ per year, which financed the writing, and the theater. Shaksper got his cut. The Earl’s lifestyle was maintained. Walsingham achieved his propaganda goals. The Queen got the poetry she loved. Walsingham got his own eye’s and ears man on the inside of the theater business, Shaksper the informant. Vere was free to write and write and write. The government maintained the separation of the nobilty from obvious labor. All this costs the government 1000£ per year. The steep price Vere paid was his name. A price he would come to regret later in life. Remember in Doctor Dodypoll we earlier found allusions to this apparant deal granting Vere’s theatrical work legitimacy. It’s worth revisiting that passage, as it is corroborating evidence for Chabot. Should in your carelesse estate so much displease. LASSIN: Quod licet ingratum est, quod non licet acrius urit. [trans -“We take no pleasure in permitted joys. And now (they both allowe it) be neglected? It is very important to acknowledge Shaksper’s role. The great body of work does not exist as it is today without this creation of “Shakespeare Inc.”, in which Shaksper as front man played a role. He was there from the beginning. He was part of the solution when Walsingham and the Queen, figured out how to harness the wayward and talented Earl of Oxford, Edward de Vere. Remember Haunce, the Shaksper character serving-man in Doctor Dodypoll reminds Earl Lassinbergh the painter by day earl by night, of his own role in creating the earl’s works. Call it “Shakespeare Inc.” Call it “the National Endowment for Theater and Propaganda,” or whatever. But in June 1586, Sir Francis Walsingham, using 1000£ from the Queen’s treasury, created a theatrical operation, harnessing the talented but wayward literary genius Vere, and using his man Shaksper as a front, to produce the greatest arts and propaganda programs of all time. We’re still enjoying the fruits of that project, and now it is no longer cloaked in secrecy, thanks to the information the contemporary playwright, George Chapman, carefully buried in the last act of his last play. The gentleman usher mentions throughout the plays of Chapman and Jonson are to Vere, and sometimes Shaksper, as the servant of the Queen or Muse. In the Widow’s Tears, the governor asks the gentleman usher if he was born in the city. Argus answers; “Ay, an’t please your honour, but begot i’th’ Court.” Shake-speare was begot in the court of Elizabeth the first, on 26 June 1586.